Product code: ES7866 Categories: Sold Items, Sold Jewellery. 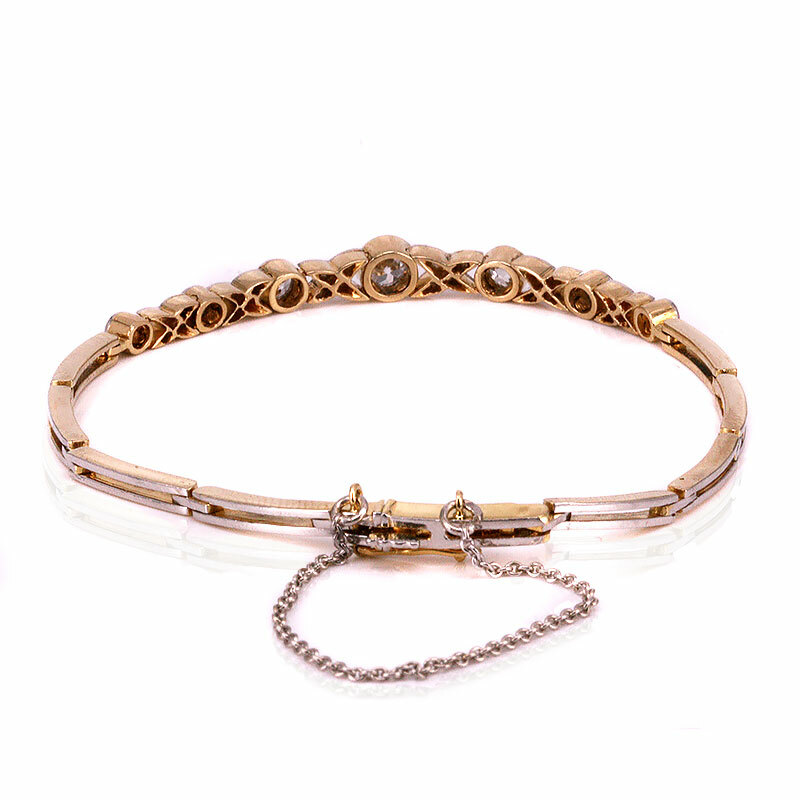 Here is a divine Art Deco 18ct gold and platinum diamond bracelet from the 1920’s that will look as elegant during the day as it will well into the night. So beautifully hand made, the bracelet is set with seven larger European cut diamonds and twenty four smaller rose cut diamonds. The diamonds come together to total 1.16 carats, however it is not just a matter of this being another diamond bracelet – there is just so much more than its modern counterpart. Being hand made allows for such incredible detail that is matched with the beautiful pure white colour emanating from the platinum and the setting has what is called a millgrain setting. This can be seen as the fine and elegant crimping along the edge of the setting which is often seen in Art Deco jewellery and finishes a piece off so well. There is such a difference to a diamond bracelet being too gaudy and over the top, to one like this which is so incredibly elegant. At the centre diamond it measures 4.8mm wide by 50mm from one end diamond across to the other, and from end to end the bracelet itself measures 17cm in length and is fitted with a safety chain for added security. No matter where or when this diamond bracelet is worn, it is sure to get the attention and admiration that it rightly deserves. Hand made in gold and platinum, this Art Deco diamond bracelet is set with European cut diamonds and rose cut diamonds.